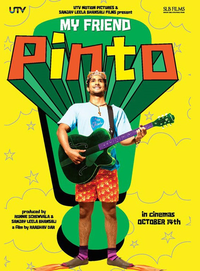 Life loses its meaning for Pinto a Goan priest in the making when his only soul mate his mother passes away. Like an adolescent unsure about his identity, the film too doesn't know what to make itself. The country bumpkin irritates, exasperates and is difficult to deal with but he is blessed with a heart of gold. My Friend Pinto is a total waste of time and a highly wannabe film. Best avoided. Leaving aside the fact that this is a Sanjay Leela Bhansali production, even as a standalone film 'My Friend Pinto' hardly manages to leave any impression whatsoever and goes down as a film that could have possibly seemed reasonably promising at a concept level but just couldn't bring in good enough meat that could have been relished. My Friend Pinto has a long way to go before he can befriend the audience. My Friend Pinto conveys the key comic patterns of Kundan Shah's Jaane Bhi Do Yaaron.There is something about My Friend Pinto. But you don't really know what.